Complies with Australian Standards Mark 3743 and has the famous 5 red ticks. During manufacture raw materials are fully composted to kill off weed seeds, pathogens and diseases. 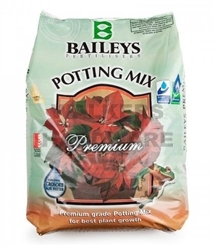 When using Premium Potting Mix you need only pot and water as complete nutrition is supplied with the addition of two forms of controlled release fertiliser; 3-4 month and slow release 8-9 month. It also contains the soil wetter Grosorb to ensure water and nutrient efficiency and is Waterwise accredited. This blend of ingredients will assist plant establishment and ensure vigorous growth, flowering and fruiting.